Located in the heart of Los Angeles, California, the University of Southern California, Viterbi School of Engineering is innovative, elite, and internationally recognized for creating new models of education, research, and commercialization that are firmly rooted in real-world needs. The University of Southern California (USC) was founded in 1880. It is one of the world’s leading private research universities. The Viterbi School of Engineering also partners with funding agencies around the world to assist talented students to pursue their Master of Science degree at USC. Doctoral programs: USC aims to fully fund all of its doctoral students. This generally consists of tuition, a stipend for living expenses, and a health benefits package. Since 1905, the School’s first priorities are the education of outstanding students and the pursuit and publication of new research. The School is proud of its interdisciplinary approach to engineering studies and its efforts to develop the next generation of leaders and entrepreneurs. More than a third of the Viterbi School’s faculty members are fellows in their respective professional societies. With 35 faculty members elected to the National Academy of Engineering and 65 recipients of National Science Foundation Career Awards, the School ranks among the nation’s very best in these important metrics of a school’s present and future strength. As a global attractor of students from around the world, the Viterbi School’s graduate Engineering programs are consistently ranked among the top in the nation by U.S. News & World Report and the world by the Academic Ranking of World Universities. The notion of engineering as a creative, empowering force in society permeates the philosophy of our school. It drives the entrepreneurial spirit of our students, faculty, and staff. At USC Viterbi, we know that fulfilling the unlimited potential of engineering relies upon the excellence of our people. Through scholarships, fellowships, and chairs, we will continue to recruit and retain an outstanding and diverse collection of students, faculty, and staff from around the world. Maintaining a perpetually high level of excellence will allow individuals to imagine, explore, innovate, communicate, and collaborate; not only with one another, but also with colleagues and experts within the engineering industry. USC Viterbi is committed to cultivating a rich culture of discovery, creativity, and entrepreneurship in the classroom, the laboratory, and beyond. Our Undergraduate Excellence Fund provides support to a range of activities and programs, including Women in Engineering; Engineers Without Borders; the Viterbi Adopt-a-Student, Adopt-a-Teacher program (VAST); andstudy abroad programs, to name just a few. We actively engage our students at every step of their university career, igniting a passion for learning that will fuel innovation throughout their lives. USC is dedicated to conducting research of consequence and, at USC Viterbi, we are unwavering in our ambition to advance solutions to societal challenges on a global scale. Across fields spanning energy, biomedical research, security in cyberspace and infrastructure, computing beyond Moore’s Law, and quality of life, faculty and students at USC Viterbi are generating innovations that will improve the lives of people and communities around the world. At USC Viterbi, we foster the work of outstanding students and faculty whose discoveries spur economic growth in Los Angeles, in Southern California, across the United States, and around the world. 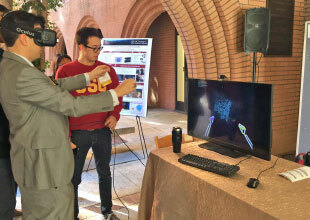 The Viterbi Student Innovation Institute (VSi2), our Hacker House, and our Startup Garage spotlight entrepreneurship and lead to successful business ventures, while events like the Maseeh Entrepreneurship Prize Competition(MEPC) and the Min Family Social Entrepreneurship Competition showcase transformative ideas that are on their way toward changing society at large.